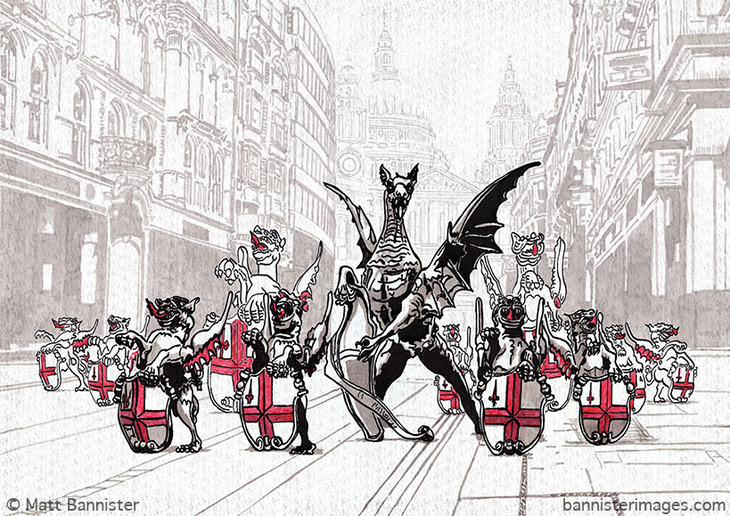 Artist Matt Bannister's latest work looks like a cross between Gremlins and a police riot squad. It shows all the dragons who normally guard the boundary of the City of London, holding some kind of ferocious reptilian moot on Ludgate Hill. Like a good artist, I took to the streets to see and photograph said dragons for inspiration, only to realise that one of them wasn't there. Wikipedia mentioned 13, but I only had 12. Then he found this blog post by The Daily Constitutional. It seems that the dragon traditionally guarding Moorgate has been removed for restoration during the ongoing Crossrail dig. Mystery solved. The city's dragons are mostly modelled on a pair from 1849, rescued from the long-demolished Coal Exchange and now standing on the Embankment. These are the taller pair, rampant to the rear of Matt's illustration. Subsequent boundary markers are half the size of the original duo, again as shown in the drawing. The tallest beast, at the centre of the squadron, is of a different design and can be found at Temple Bar, where it has stood since 1880. You might recognise Matt's style, as he's thrice appeared on these pages before: once depicting the Crystal Palace dinosaurs on the move; again showing Boudicca stuck in a traffic jam; and again showing Victoria and Albert seated in a modern park. Check out his other works here.